Rev. 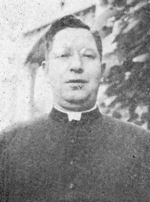 Alfred A. Bergeron, CSV, died Aug. 7, 1960 after suffering a heart attack in the rectory of St. Viator Church in Chicago, where he had been assistant pastor. He was 45. Fr. Bergeron was born Nov. 30, 1914 in Exeter, NH. As a child he contracted rheumatic fever, which damaged his heart and ultimately contributed to his untimely death as a young adult. His early education was with the Edmundite Fathers in Vermont in the 1930s. As a young man, he applied to the Viatorian Community in Joliette, Quebec, Canada, and was referred to the Province of Chicago, where in 1936, he entered the Viatorian Novitiate in Lemont, IL. Fr. Bergeron professed his first vows on March 10, 1938, but his courage and love for the Community would be tested over the next few years. While a student at St. Viator College in Bourbonnais, IL, the college closed at the end of the school year. He then spent a semester as a guest at the Resurrectionist House of Studies at St. Louis University, followed by a year of sparse meals as a graduate student at the University of Illinois in Champaign, where he earned a master’s degree in French. Fr. Bergeron spent three years at Kenrick Seminary in St. Louis, where his seminary studies were accelerated because of World War II. He was ordained to the priesthood on August 29, 1943 at St. Joseph Church in Springfield, IL by the Rev. James Griffin, D.D. His first assignment was at St. Joseph School for the Deaf in the East Bronx of New York City. He loved to tell of his first sermon, using American Sign Language for the deaf children. Fr. Bergeron then spent a year at Cathedral High School in Springfield, IL from 1947 to 1948, followed by a year at St. Benedict High School in Savannah, GA. The next four years, 1949-1953 were spent teaching French and religion at Archbishop Stepinac High School in White Plains, NY. Fr. 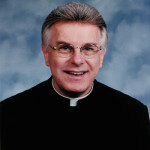 Bergeron was transferred to St. Viator Church in Chicago as assistant pastor in 1958. Although his heart was failing during this time and his physical activities were curtailed, he still heard confessions. His death came quite suddenly on a Sunday evening.